PerksPlus is a corporate travel program that rewards businesses that book travel with United and United's partner airlines. United PerksPlus is a corporate progam designed for small to medium businesses that spend at least $25,000 on travel with United (and partners) every year (if based in the US or Canada). If your total travel spend is less than $25k, this is not the program for you. If your company is based in Latin America, then your spend needs to be $15k, and if you’re in the Caribbean or Central America, your United spend needs to be at least $10k USD to consider this program. At first, this seems like an arbitrary minimum, but it’s forcing users of the program to be actual companies instead of individuals or sole proprietors who don’t fit within United's target market. You also need a tax ID and 5 employees to register. Your company can't have an already negotiated travel agreement in place and register for this program. What is the difference between PerksPlus points and MileagePlus miles? MileagePlus is a frequent flyer program for individuals while PerksPlus is a rewards program for companies. MileagePlus miles are completely different from PerksPlus points. They cannot be transferred between programs but both can get you almost free flights (you still have to pay the taxes). The best part is that you can "double dip", which means you can earn both personal MileagePlus miles as an individual traveler and company PerksPlus points on the same trip. How do I earn PerksPlus points? Firstly, you need to enroll your company and meet the minimum spend threshold of booking at least $5,000 USD every month for 3 consecutive months. You earn points over this time, but you can only redeem the PerksPlus points after you meet this spend requirement. Latin American, Central American and Caribbean companies only need to spend $3,000 USD until they can begin to redeem points. You earn 1 point per $1 USD on “Qualifying Revenue” which is the flight price excluding taxes, service fees and refunds. For US and Canadian businesses, you earn a multiple of 1 point when flying to/from a non-hub airport. You can fly on any flights operated by United, Lufthansa, Austrian Airlines, Brussels Airlines, Swiss International Air Lines and All Nippon Airways. The 9 United Hubs are Chicago (ORD), Denver (DEN), Guam (GUM), Houston (IAH), Los Angeles (LAX), Newark (EWR), San Francisco (SFO), Washington (IAD) and Tokyo (NRT). Essentially, on routes where you choose to fly United where other airlines are more prevalent (outside of United’s hub airports), United is rewarding you for making the choice to fly with them. You also earn a multiple of points when booking business/first class. For businesses based in Latin America, Central America and the Caribbean, you receive WAY MORE points than your lowly US/Canadian neighbours. Your flights have to be purchased and ticketed in Latin America, Central America or the Caribbean, and you only recieve PerksPlus points on United flights. For example, as a US-based company, if you book a round-trip flight from Los Angeles (LAX) to London (LHR), you can see the booking code on United’s site if you click “Details”. In this case it’s Booking Class K which is listed as “Tier 3 - Highly discounted leisure fares”. The taxes on this fare are a whopping 37% of the total cost, $207.96 of a $557.96 total. So you only earn PerksPlus points on the remaining $350.00. In this case, you only earn 350 PerksPlus points as SFO is a United hub. However, if your company is registered in Argentina, a K class booking gets you 3 points for $1 USD. Right? Let’s check. 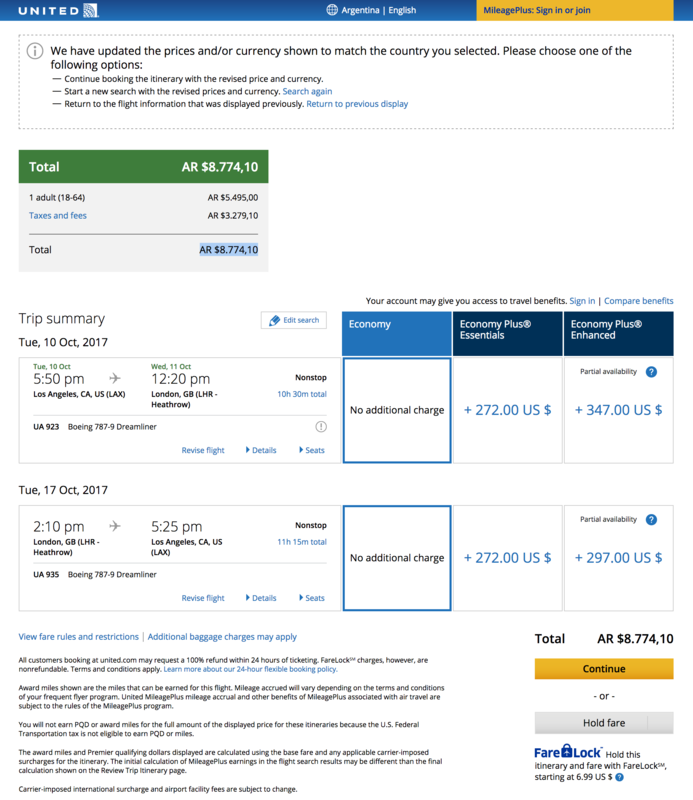 If we switch the United site to Argentina, and find the exact same flight, you see the base fare is AR $5.495,00 = roughly $355.00 USD. This equals 1,065 PerksPlus points. And this is similar to many other Latin American, Central American and Caribbean countries I checked. United is obviously targeting new companies by trying to get more bookings from non-US based companies. By doing this though, they’re also choosing not to equally reward the US and Canadian companies who already use United for their business flights. How can I use PerksPlus points? There are a number of ways you can use the points earned, from 10,000 points to 1,000,000. 10,000 points will get you 20 United premium beverage vouchers that you can use onboard any United flight. 65,000 points will get you a United Club membership for a year. And 120,000 will get you a year of MileagePlus Premier Gold Status (2 free checked bags, free access to Economy plus seats, upgrades and more). A premium bevvy (like a Bombay Gin and tonic) sets you back $8.99, therefore 20 vouchers are worth $180. This values your 10,000 points at 1.8 CPP (cents per point) each which actually isn’t bad value at all. On the other hand, a United Club membership costs $550, valuing your 65,000 points at 0.85 CPP. This is not a great redemption value. Other ways to use your points are with Award Travel Certificates. For 40,000 points, you can redeem a round-trip Economy K-class certificate for anywhere within US 48, Canada, Alaska, Caribbean, Mexico, and Central America. Business and First class awards are usually where you get the most bang for your point, but unfortunately with PerksPlus, this is not the case. Traditionally, when purchasing a business class fare it’s many multiples of the Economy class price. 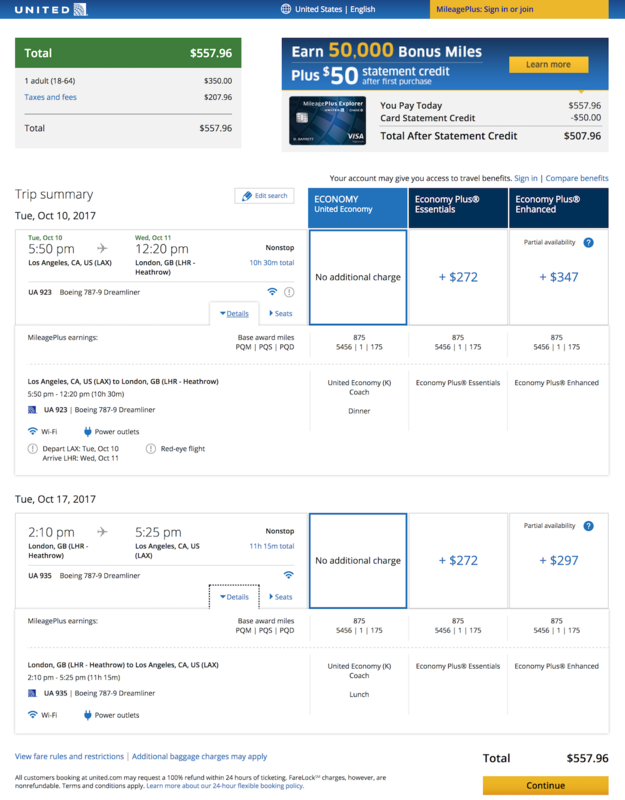 For example, a non-stop United flight from Chicago to Paris in September is $760 in Economy and $3,218 in Business (a multiple of 4.2x). When using miles, the multiple is generally around 2x instead of 4-5x the cash price. The same route starts at 60,000 MileagePlus miles to redeem in Economy and 115,000 miles to redeem a Business class seat (1.9x). However with PerksPlus points, a flight from the US to Europe in Economy Class starts from 70,000 points, whereas Business Class starts from a whopping 400,000 points = 5.7x. Do the math on your next PerksPlus award flight in business or first class so that your multiple comes in less than the cash price multiple. If you fly with United a lot, it is worth the effort as you’re double dipping points. If you don’t fly United much, then no, it’s not worth the effort. You need to be booking the minimum spend amount every year, otherwise United will terminate your account (you’ll have 90 days to redeem any unused points). Let us know if you’re unsure whether to sign up for this program, or if you can’t be bothered making sure everyone in your company is adding the PerksPlus number to their flights. Request a demo and we’ll handle it all for you.